An Iraqi refugee who worked for the U.S. government in his home country for more than a decade was released from detention Saturday afternoon after being held at John F. Kennedy International Airport for about 18 hours. Hameed Jhalid Darweesh was one of two Iraqi citizens who were on flights when President Trump signed an executive order that temporarily closes U.S. borders to refugees. Upon release, he was greeted at the airport by supporters who are critical of Trump's executive order. The group of demonstrators carried signs and chanted to call for the release of the two men. "This is the soul of America," a gracious Darweesh said of the supporters. "Thank you very much. We know America is the land of freedom, the land of freedom, the land of light. I am very thankful and very happy." The two men were detained at Kennedy Airport when their separate flights landed, the New York Times reported. Ten other travelers are also being held at the airport, Congressman Jerrold Nadler (D-NY) said. It was not immediately clear what countries they came from. Lawyers for the two Iraqi refugees filed motions in the Eastern District of New York, seeking a write of habeas corpus in an effort to get their clients released, NBC News reported. 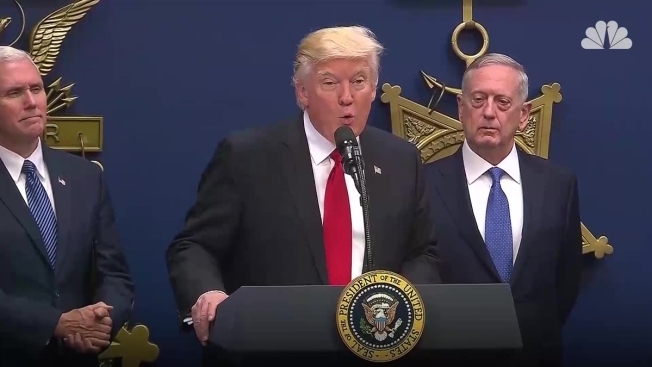 Trump's executive order barred all refugees from entering the United States for four months, and indefinitely halted any from Syria. Trump argued the ban is needed to keep out "radical Islamic terrorists." The order Friday immediately suspended a program that last year resettled in the U.S. roughly 85,000 people displaced by war, political oppression, hunger and religious prejudice. Trump indefinitely blocked those fleeing Syria, where a civil war has raged, and imposed a 90-day ban on all immigration to the U.S. from seven Muslim majority nations, citing terrorism concerns. The U.S. may admit refugees on a case-by-case basis during the freeze, and the government will continue to process requests from people claiming religious persecution, "provided that the religion of the individual is a minority religion in the individual's country." Both Darweesh and the other refugee detained at JFK have ties to the U.S., according to the Times' report. Darweesh worked with the U.S. in Iraq in a number of roles, including as an interpreter for the U.S. army. He had been targeted twice for working with the U.S. military, according to the report. The wife of the other detained man worked for a U.S. contractor, the Times reported. Meanwhile, two Syrian families who arrived at Philadelphia International Airport Saturday morning from Doha, Qatar, were briefly detained and then sent back on another 18-hour flight, according to a family member from Allentown, Pennsylvania. The families, made of up two brothers, their wives and two children, were detained by Customs and Border Protection officials after disembarking a Qatar Airways flight at 7:25 a.m., according to Joseph Assali, of Allentown. Three hours later, the six were put back on a Qatar Airways flight back to Doha, Assali said. Cairo airport officials also said seven migrants bound for the U.S. were prevented from boarding an EgyptAir flight to New York's JFK airport. Six of them are from Iraq and one from Yemen. The officials say the migrants, escorted by officials from the U.N. refugee agency, were stopped from boarding the plane after authorities at Cairo airport contacted their counterparts in JFK airport. In response to the executive order, Iran's foreign ministry suggested the country will limit issuing visas to American tourists. The official IRNA news agency Sunday carried a statement by the Iranian foreign ministry that says Iran will resort to "counteraction" to Trump's executive order. The statement says: "Iran, to defend the dignity of the great Iranian nation, will implement the principle of reciprocity until the removal of the insulting restriction against Iranian nationals." The statement adds: "It will apply corresponding legal, consular and political actions."